Join us for a special 2 day wedding dress sample sale and save BIG on your designer wedding dress! 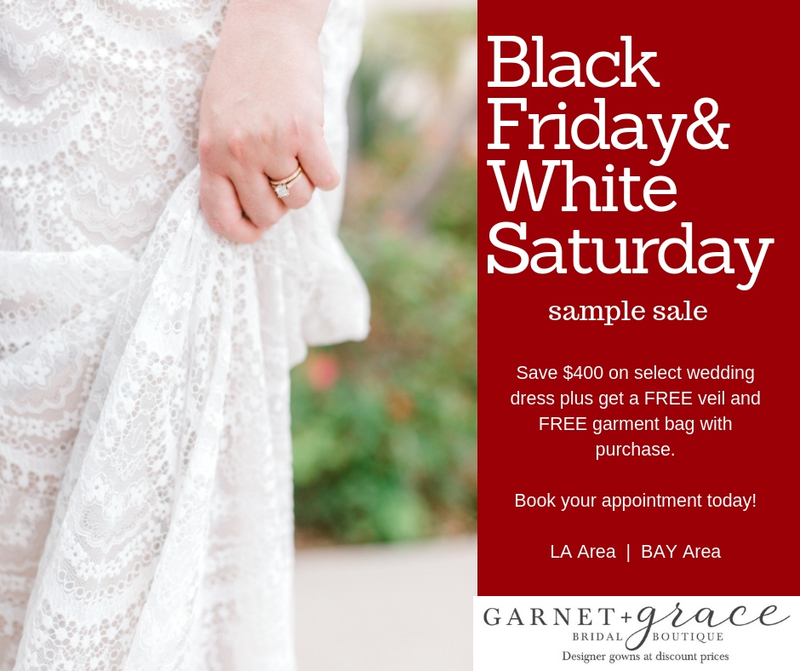 GARNET + grace is having a huge Black Friday/White Saturday wedding gown sale on November 23rd and 24th. We’re marking down select discount designer wedding dresses an EXTRA $400 off. Plus you’ll get a FREE veil and FREE plastic zipper garment bag with your purchase. Sale wedding dresses will start at just $199! 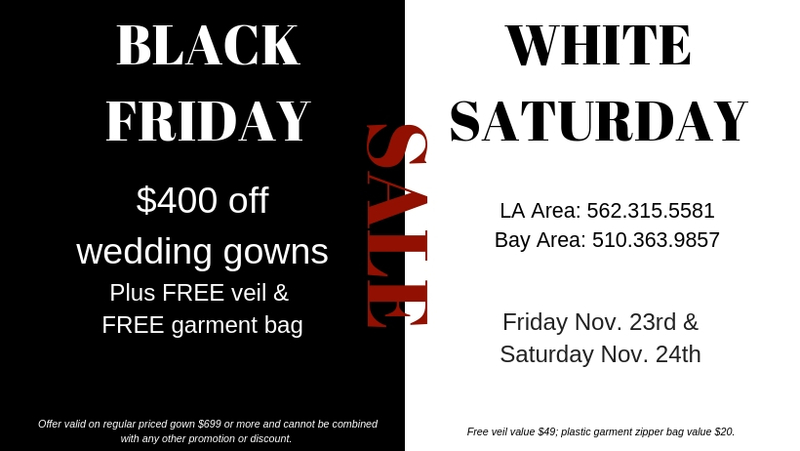 This big two day sale will be in both our Bay Area bridal boutique and our Los Angeles bridal store. Here are just a few of the amazing wedding dresses that will be in the sample sale. 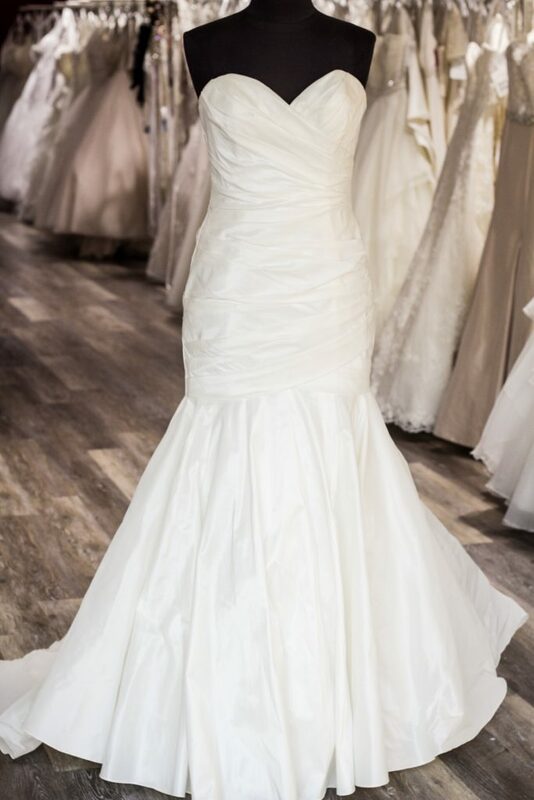 This size 12 dropped waist ruffle wedding dress is Adriana Alier. You’ll love the sweetheart bodice with ruching because it really cinches the waist before flaring into a softly tiered skirt. Available in ivory in our Hayward bridal store, it was originally $1199, now just $899 during our sale. The bodice of our next wedding dress sample sale gown is something special! It’s a strapless dropped waist ballgown wedding dress with STUNNING beaded lace appliques with gold embroidery. You’ll be amazing by the full skirt and full lace train. The beaded trim on the bodice is so sparkly, too. We love adding matching accessories to this gown – the gold combs are so perfect! Find this bridal gown in our Hayward bridal boutique, too. 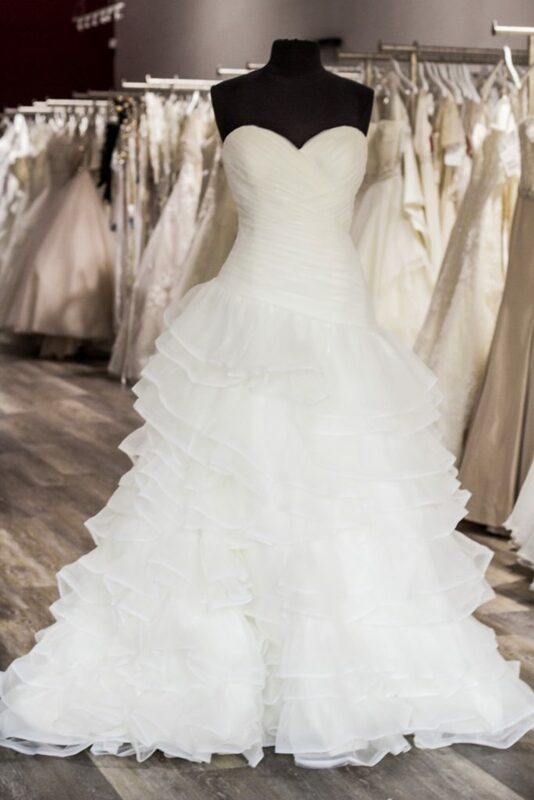 It’s by David Tutera and available in a size 10 (runs small!). It was originally $1800, but in our store just $1349. Get an extra $400 off during our wedding dress sample sale November 23rd and 24th. 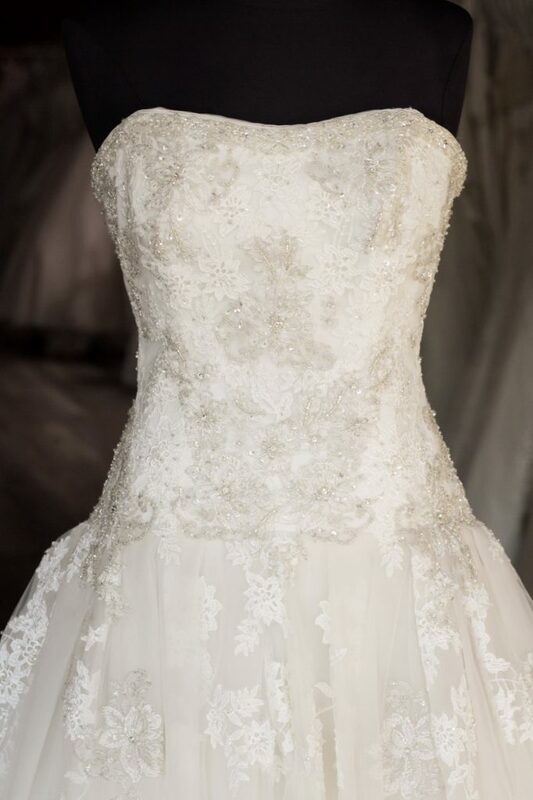 For our brides who like classic wedding gowns with clean, simple lines, this is our favorite in our East Bay bridal store. You’ll love how we can add tons of accessories likes a sash, beaded cap sleeves or shoulder jewelry to give you exactly the look and feel you want. This is a strapless ruched taffeta trumpet gown by Two by Rosa Clara. It’s a size 10 and is tagged at just $1049. Get this stunner for just $649 during our sample sale. Book your appointment online now for this 2 day wedding dress sample sale in our Hayward, CA and Whittier, CA bridal boutiques!